PZ recently linked to a rather disturbing video on display on GodTube. I don't recommend actually watching it (though it is perhaps appropriate for Halloween), so I'll summarize. It's a fictional letter from a guy in hell to his living Christian friend asking why, oh why, wasn't he told about this ...Jesus. It's supposed to be a call to all Christians to start proselytizing to their friends, if they truly care for them. Obviously, there are a lot of different things I could say about this, but my first thought was that hell isn't completely compatible with any sort of ethics that involves caring for others. Let me elaborate. Hell (along with Heaven) is a sort of poetic justice, seemingly taken out of fiction and put into real life. Hell is supposed to be a motivator to do good, because your good actions here will be translated to good rewards in the afterlife. Why be altruistic? Because if you care for others in this life, you will get taken care of in the afterlife. In other words, altruism is justified because it translates to selfish goods at the endgame. Heaven and Hell: a possible basis for ethics? I would argue that under this system, altruism doesn't apply to the afterlife itself. Consider a situation in which you have the opportunity to sacrifice a bit of your own afterlife pie in order to save someone else from hell. For example, maybe you had to fib a bit to get them to come to your church or something. Maybe afterwards, you could confess so that it wouldn't hurt your own eternal fate at all. Is it justified? Would it be justified if you converted people through threats? Through coercion? Through terrorism? Would it be justified to sacrifice your own soul by killing innocent babies before they have a chance to sin? Perhaps you were already convinced you were irrevocably going to hell, so you might as well help as many other people in the process. I think it should be taken it for granted that none of the above are justified. Also, Hell only really provides motivation for altruism that concerns this life, not the next. Therefore, altruism is only justified and motivated under the heaven/hell system if you care for people's real lives, not their afterlives. It's internally consistent, at least. But, shoot! It seems that excluding the motivation from heaven/hell, people still feel the need to be altruistic. Who knew? That's why you get people who care about your afterlife, and are willing to sacrifice simple civility to save you. These people are clearly misled... but at what point did they make a mistake? A reader tells me there was an article in the LA Times about psychics, and wants my comment. Since the Biz section is preoccupied today with matters of mortality, I figured I'd take a look at those who employ otherworldly means to help people prepare for the inevitable. It's an industry that, by some estimates, runs into the billions of dollars annually. Let me pause here to apologize to all the "legitimate" psychics out there who resent being lumped together with the scammers. I'm braced for a flood of calls and e-mails threatening all manner of hexes and curses. But if you're that good, you should have contacted me before this column was published. But the more I thought about it, the more I understood that what fortunetellers are selling isn't a tangible product. It's a sense of hope, of taking control of uncertainty. It's the same product religious types have been selling for centuries. "This industry has been around forever, since before there were laws. It's something we want. We're wired for this." The writer of the article, though rather critical, is still far more generous than I would have been. You'd have to be pretty gullible to believe in psychics--it's even worse than astrology! And yet, it's a billion-dollar industry, as the article says. None of that money is from the million dollar challenge, I can tell you that. For skeptics, there's always the question of whether bunk like this is propagated by overly credulous people or intentional lying. Many psychics are the latter, though you can't ever underestimate the ability of people to fool themselves. As for the "sense of hope" being offered by psychics, what kind of hope is that? It's the kind of hope that shrivels up and disappears upon closer inspection of the truth. This is the very definition of "false hope". Sure, there is some value in false hope, but don't confuse it with the real thing. Are we "wired" for this kind of thing? I doubt it. I think it's way too cynical to say that every human behavior is made inevitable by the ancient evolutionary history of the human species. Oh, I'm on the verge of ranting about evolutionary psychology here... but another time. For now, I'll just ask, are we wired for racism? Possibly, but that sure doesn't justify it. Oh, and did he just compare psychics to religion? If I were religious, I'd be insulted. Oh, wait, I apparently still have lots of mysterious number tables. What are those things? The buzz is that Dumbledore is gay. Or it was, a week ago. Yeah, I'm pretty slow at reporting news. Anyways... spoiler alert? So if you hadn't already heard, you're probably not paying attention to the important news. Oh... wait. But if you haven't heard, Rowling said at an event (transcript here) that "[She] always thought of Dumbledore as gay." And, of course, a conservative writer gives his obligatory indignant response (via Pharyngula). Pretty funny, actually. In that article, John Mark Reynolds questions the authority of Rowling over her stories. Unfortunately, fiction is not like the real world, and there are genuine authorities. That said, if the fan base wants to, it would be possible to remove it from the canon, especially since you would never have known if Rowling hadn't said anything. However, I think Rowling's claim, now that we've all heard it, stands on its own without her authority, really. Dumbledore's homosexuality explains why he followed around Grindelwald when he was younger--it wasn't Grindelwald's crazy fascist agenda, but Grindelwald himself. That means that Dumbledore's greatest character flaw has an excuse. Also, Dumbledore was always talking about the "power of love", and now we know why. So... into the canon it goes! 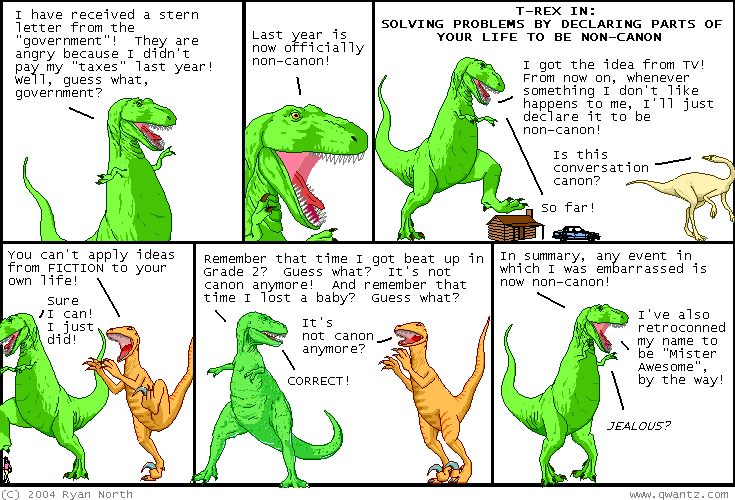 And for no particular reason, it's time for some Dino Comics! This feeling of senselessness you now have is called surrealism. I want to hurry up and finish the intro/expository posts and talk about real material. So this is the last "intro" post on this topic, and in it I will describe several groups that overlap with atheists. Note that you need not be an atheist for any of these labels to apply. Anyone who hangs in the skeptical blogosphere probably already knows this stuff, but not all my readers do. This is, of course, my personal favorite. I've already described it here. It's similar to rationalism, with an emphasis on science. To the skeptical atheist, religion is just one more claim without evidence. Secularism actually does not mean atheism or theism, but neutrality between all religions. If I call myself a secularist, that usually means I advocate separating church and state. Everyone, including the religious, is better off with a secular government. Humanism is an ethical philosophy based on the dignity of all humans. Most Humanists I see are part of a subcategory called Secular Humanism. Secular Humanism advertises itself these days as being the "positive" part of the atheist worldview. As the story goes, atheism is simply a rejection of gods, but you can't stop there because that is only a negative claim. Secular Humanists often recognize the good things that come out of religion (ie community, ethics), and try to provide secular alternative routes to these goods. This refers to a specific group that follows the philosophy of Ayn Rand. I can't say I understand it well enough to explain it, but I guess atheism happens to be one of their beliefs. Objectivists are always politically libertarian, which means liberal on social issues and conservative on economic issues. This is supposed to be a very inclusive label that applies to anyone who doesn't answer the question "Do you believe in God" with a yes. Some people think nontheism and atheism are in fact the same thing, but I won't go into the semantics. A freethinker is anyone who has rejected organized religion. Atheism is only a subset of this larger group, but I think it's a majority, or quickly becoming one. I described some other groups within freethought just the other day. I already described this just the other day, but I'll just note here that agnosticism overlaps with pretty much every freethinking group. What a lot of words and labels! Doesn't it seem like atheists must like making new ones all the time? Well, in this case, they really did make up the label, in just 2003. The idea is to replace "atheist", with all its negative connotations, with a happy word, just like the word "gay" for homosexuals. The official webpage defines a Bright specifically as a naturalist, meaning no supernatural beliefs. I don't particularly like the word because, apart from being very contrived, I think it connotes arrogance, as if I thought I was brighter than everyone else. Regardless, some people disagree, and I see it used on occasion. Now that you've seen all the common labels, you may mix and match them to apply to yourself. I picked atheist, agnostic, skeptic, secularist, nontheist and freethinker. Hooray for identity politics? Here I attempt to describe a few of the words used to describe people who are on or around the atheism/theism border. The first one that of course everyone has heard of is agnosticism. Usually, an agnostic is defined as someone who doesn't know whether a god exists, thinks that it is impossible to know, or thinks the very idea is meaningless. This description fits almost anyone outside of religion, so an agnostic can really be anyone who has taken a liking to the word. That said, most agnostics I've seen tend to be very similar to atheists, aside from a few distinctions that are a little too subtle for me to understand. If you asked me, it is impossible to absolutely know anything outside of math and logic, but I am entirely unsure of whether that qualifies me as an agnostic. I must also mention that atheists tend to negatively stereotype agnostics as fence-sitters who simply don't have the courage to admit that gods are as unlikely as fairies. That is, atheists seem to think agnostics actually give equal weight to the two possibilities of god and no-god. This stereotype simply has not been reflected in my experience; most agnostics seem to hate the stereotype. But I've reason to believe that it's reflected in at least some agnostics out there. What did I say earlier about straw men in large debates? The word "deism" usually refers to belief in a god who does not participate in the world. The deist might be persuaded by one or more of the arguments for God's existence, but not persuaded by arguments from revelation or miracles. In other words, the Deist accepts the notion of a God who created the universe, but rejects the notion of a God who constantly meddles with humans. This might be the most likely position for a skeptical theist to take, since there are obvious parallels between so-called "miracles" and paranormal claims. Pantheism refers to the belief that God is the universe, or the nature of the universe, or something along those lines. There is an argument for God that goes like, "The universe must have an ultimate cause, an uncaused cause, and we call that God." One of the counter-arguments is, "Why can't the universe itself be the uncaused cause, or "God" as you called it?" I think pantheists take this argument seriously. Arguably, pantheists have redefined the word "god" and are talking about a completely different concept. I don't see many pantheists around, but it's often said that Einstein was a famous case. All those famous quotes, such as, "God does not play dice," should be interpreted accordingly. Those are the three major categories, but there are a lot of other terms being thrown around, and a lot of people who fit under none of them. I once knew a guy who believed that every human's consciousness was a small piece of God's consciousness. What in the world would I call that? I prefer to refer to the entire group collectively as freethinkers, which means anyone who has rejected organized religion. Earlier, I had taken a class on the history of modern art. Now, I'm not a big fan of history. Frankly, I find it boring, especially ancient history. But one thing I've found interesting (and I've only seen this in college) is the history of ideas and culture. I liked the class on modern art not so much because of the art (I guess surrealism is good), but because art, especially in the modern art period, provides a cross-section into the ideas of each time. Realism was an art movement that lasted from around 1850-1870. For those who don't know, the realist style consists mostly of paintings of peasants and workers from real life. For the class, I read an article (sorry, no reference available) which was talking about the Realist attitude towards all sorts of things including the subject of art, the technique of art, social classes, and science. It was that last one that caught my eye, of course. The author described Realist art as trying to become more like science (which would in turn become more like art). Since the goal of art was truth, artists would try to look at their subjects "objectively" and without emotion. I disagree with the whole attitude about art's goal, but aside from that, I think the Realists have severely misunderstood science. Yes, science is objective, but it's not about objective observation. If a scientist claims that he has measured things "objectively" and without any passion, does that really carry any weight? How could we even measure how objective we are? Scientists are humans too, and they are not necessarily any more objective than anyone else. I might even argue that scientists must look at everything subjectively, through the lens of scientific theory, in order to make any sense of the world. The way we get objective truths out of all this is we apply the scientific method. We correct for selection biases, use a control group, apply error analysis, have a peer-review process, etc. And then we test the results over and over again in case any mistakes were made the first time. Science distills objective truths from scientists' subjective experiences. I think the attitude that scientists must observe "objectively" is what got us the useless notion of avoiding the first person in scientific reports. Just another reason to hate the idea. To go back to the art, the objectivity really shows! See, it's no coincidence that peasants became a subject right at a time when people were worried about proletariat revolution, and around when the Communist Manifesto was published. Realism was first created by revolutionaries, but it was of course later adopted by people who took the opposing point of view. Look at The Gleaners by Jules Breton. Yep, look at the happy peasants. They're not at all upset about being on the bottom of society and having to bend over all day to collect the last bits of grain. And what a benevolent supervisor (on the right) they have! Did I mention that since it's Realist, it must be the objective truth? I wonder if this same attitude was reflected in scientists at the time or if it was just artists who thought this way. I hope it was just the artists. There is a classic puzzle that involves four cards on a table. On the cards are written 4, W, 6, and R. You are told that each card has a letter on one side and a number on the other. You are asked to consider the statement, "If there is an R on one side, then there is a 4 on the other." Which cards must you flip if you want to find out if the statement is true or false for the four cards? Continue only after you've made your guess. Ok, so it's not really much of a puzzle. It's really easy, but still seems to catch a lot of people. If you answered the cards with an R and 4, you've got it wrong. The reason you don't flip over the 4 is that if there is an R on the other side, the statement is true, and if there isn't, it's still true. Unless the first part of the if-then statement (called the antecedent) is true, it doesn't matter whether the last part of the if-then statement (called the consequent) is true or false. For example, it doesn't matter what number you find behind the W, since there is no R and the antecedent is false. You must flip over the 6 because if there is an R on the other side, the statement has been confirmed false. So the correct answer is the R and the 6. If you really want to be tricky, I guess you could write an R next to the 4, thus assuring the statement is false without any flips. To introduce some symbolic logic (if you already know about this, skip ahead), all statements in logic can be represented by a single letter, just like in algebra. So the above if-then statement can be shortened to "if X, then Y" where X is the antecedent and Y the consequent. The symbolic way of writing this is "X ⇒ Y". By definition, "X ⇒ Y" is false if and only if X is false and Y is true. There's a related logical statement that uses "if and only if" (often shortened to the not-a-typo "iff") in which it does matter if Y is true when X is false. But that's not the case here. Ok, I'm sure some of my readers are bored by now, but there's an interesting paradox to conclude this post. Consider the statement, "If this statement is true, then God exists." If the statement is false, then the antecedent is false, and therefore the statement is true. Since being false leads to a contradiction, the statement must instead be true. Therefore God exists. Now that that's settled, I guess there's no longer any need to discuss atheism. Wait, you want me to resolve the paradox? Say "please." In contrast with last time, today's fallacy is considerably more obscure, and yet has wide applications. In brief, the sunk-cost fallacy is when you make a suboptimal decision only to keep past efforts from going to waste. Say you are playing a gambling game that I just made up with dice. First, you pay one dollar to start the game. Then, I roll one die. After you see the roll, you may either give up, or pay another dollar. If you've paid, I roll another die. If the total of the two dice is at least 7, you win four dollars. The probability of getting at least a 7 is equal to 21/36. Since you have over 1/2 chance of winning, and the payback is double the cost, this game is overall profitable to you. However, what if you got unlucky with a 1 on the first die? Should you continue or quit? In this case, you have a 1/6 chance of winning, and the payback is 4 times the investment. Therefore, it would be more profitable to quit. But won't that cause your previous dollar to go to waste? Take this more realistic example. Let's say that we have invested a lot of money in a war. And let's say that in the middle of the war, we suddenly realize that the rest of the war will cost significantly more than our previous expectations, and will achieve far less than we thought. Let's assume that upon the cost-benefit analysis of the remaining war, we find it would be better to give up at this point. But if we give up, won't all those lost lives have been in vain? Well, yes. The sunk-cost fallacy doesn't necessarily mean that making the initial investment was an incorrect decision; at least in the gambling game, you were correct to pay the initial cost. New information or unlucky outcomes can make that initial investment have been for nothing. But we have no control over this, at least not anymore--what's done is done. The key is that it's not the previous investments that are relevant to the decision, but the future ones, the ones we have control over. In both of the examples, it's the future investment that will go to waste if we choose incorrectly. Of course, in any "real" situation like a war, there are a lot more complicated issues involved, and no one actually uses the sunk-cost fallacy as their primary argument. Nobody relies on the argument that "soldiers' lives will have been in vain" or uses any sort of catchphrase like "stay the course", right? Right. One of the reasons that the sunk-cost fallacy can be so compelling is that in real life, things like honor and image seem to have intrinsic value. We don't want to admit to having made a bad decision. We don't want to look bad in front of others. We feel bad about having wasted lives, and damn it, emotions are powerful. But it's not always best to go with emotions, and the sunk-cost fallacy is an excellent example of when this is the case. For a long time in physics, there had been a debate about the nature of light. Is light a particle or a wave? Nowadays, we know that it's both, but that's another story. In Einstein's time, light was primarily thought of as a wave due to the discovery of Maxwell's equations. Maxwell's equations are a bit advanced to go over for my purposes, but all you need to know is that they completely describe the behavior of electric and magnetic fields. Electric fields affect magnetic fields, which affect electric fields, and so forth. To gloss over all the math, this feedback loop creates an electromagnetic wave that moves at the speed 2.998 x 108 meters per second. This number matched the speed of light so well that Maxwell correctly guessed that light is made of electromagnetic waves. At the same time, there was something very odd about Maxwell's equations. In classical mechanics, all velocities are relative. We cannot feel the Earth moving beneath us because we're moving at the same speed. We cannot feel the Earth's orbit because we orbit along with it. We cannot feel our solar system's orbit around our galaxy, or our galaxy's motion through the cosmos. If the entire universe was moving in one direction, we could never know, since we move along with it. Maxwell's equations predict a specific velocity for light, but a velocity relative to what? At first, scientists postulated that light was moving with respect to something called the luminiferous aether (nice sci-fi name there), also just called ether. The ether is supposed to be a medium for light waves the same way that the ocean is a medium for ocean waves. The ether would operate on light similarly to how wind operates on sound. Light would move faster when moving in the same direction as the ether, and slower when moving in the opposite direction. Since the earth cannot possibly be staying still with respect to the ether (since for one thing, it rotates), scientists predicted that light would move faster in some directions than in others. The famous experiment to test this was called the Michelson-Morley experiment, which involved putting two light sources on a rotating table. The experiment failed spectacularly, showing that light moves at the exact same speed in all directions. In science, a failed experiment only provides new opportunities. To Einstein, the Michelson-Morley experiment showed that we must discard the concept of ether, along with many other things from classical physics. Einstein found that the speed derived from Maxwell's equations is very special in that there is no need to specify a reference frame. The speed of light is the same no matter which way you are going. So I'm an undergrad physics major, as my brief profile mentions on the left. But I don't know that there's a whole lot to write about. I actually love all my classes, and manage my time very well, so there isn't exactly a whole lot of drama going on. I'd love to explain physics concepts, but I have to stick to what I know, which is certainly less than, say, the physicists over at Cosmic Variance. But there's still a whole lot, and it includes Special Relativity (abbreviated SR). Lay people seem to think that you need to be an Einstein to understand it. There's also the idea that not even physicists can get a true understanding of the theory; they only know how to do the math and output the numbers. These are all wrong, at least when it comes to SR, which is a relatively simple theory. I think SR is something that any interested reader can come to fully understand. Oh, and don't confuse Special Relativity with General Relativity, which by contrast is a much more difficult theory to understand. If you're imagining the warping of space--that's General Relativity. The first thing to understand is why SR is even needed. The problem arose from many experiments involving the speed of light, and most famously the Michelson-Morley Experiment. These experiments showed that light moves at the same speed in all directions, regardless of the motion of the source of the light, or the observer. That means that if I shoot a beam of light at you, you will measure the speed of light to be going at the exact same speed regardless of whether you are moving towards me or away from me. If that seems only vaguely paradoxical at first, consider this thought experiment: you are on a longboard, and I am standing still. Right when you pass by me, I shoot two beams of light, one forwards and one backwards. Because both beams of light move at the same speed, I will always be right at the midpoint of the two beams of light. However, the same is true for you, even though you are moving on past me. So at any instant, each of us is at the midpoint of the two beams of light, even though we are at two different locations. How can that be? The solution to this, as many people know, involves radically changing our view of time, space, and whatnot. I'll leave that explanation for future posts. Simply put, an atheist is someone who doesn't believe in gods. The opposite of an atheist is a theist, someone who believes in at least one god. Or something along those lines. The precise details of the definition are contested a lot. For example, a lot of people will draw distinctions between "having no god-belief" and "believing in no god." I'm not even going to touch that one. Some people will say that everyone is either an atheist or a theist, but there also lots of people who try to place themselves somewhere in-between. Under this definition, babies are atheists, which is acceptable to some, but not all. Other distinctions include those between "strong" and "weak" atheists, "positive" or "negative" atheists. These are all loaded words, and I'd rather not promote their use. One thing that all the definitions have in common is that atheism does not imply certainty of God's nonexistence. There's an argument against atheism that goes something like this: "How can atheists be absolutely certain that God doesn't exist if only God can have that knowledge?" Never, ever make this argument. It only shows you have failed atheism 101. Some people (never people who calls themselves atheists) actually argue that all atheists are wrong, and that atheism actually does mean being certain. They might support this argument with the word's etymology, or historical usage. That's silly. I don't care what the word used to mean, not unless I'm reading old literature. Words change. So what does the set of all atheists have in common? Aside from not believing in gods, there are and there aren't similarities. Some atheists like to say that most of us have common views like humanism, naturalism, secularism, skepticism, etc. (definitions for these words later! ), and this is at least partly the case. Simultaneously, other atheists will talk about the diversity of the atheist group. There's also talk about the "herding cats problem," which refers to atheists' resistance to organization for whatever reasons. So even to me, it's unclear how diverse the group is. Though I said in my previous post that you can ultimately define words to mean whatever you want, I'm now going to point out that this isn't true. For example, I can't define something that is obviously impossible, or create a system of axioms that is inconsistent. Furthermore, it is difficult or impossible to prove that definitions or axioms are self-consistent. Proving consistency, in fact, would require a framework within an even bigger system, which itself may be inconsistent. Now that I've poked large holes in my own argument, will I move on to less philosophical topics where I actually know what I'm talking about? Perhaps. Welcome to the philosophy category, where I talk about the meaning of life and other words. This particular post is based on a intro philosophy class I am currently taking, and on my own prejudices. In philosophy, all knowledge is divided into two categories. Those categories are "a priori" and "a posteriori". Over history, the line between these two categories has been drawn in many different ways, but I'm going to talk exclusively about the definition of our own era (what you might call the post-modern era). Funny, when we covered all the various definitions of "a priori" throughout history, this was the one that came most intuitively to me. Perhaps I am just a product of my own time. A priori truths are propositions that absolutely must be true, just based on the formal definitions of the words. A posteriori truths are those that require justification by actually observing the universe. It seems to me that the definition of a priori is pretty close to "things that require only deduction, no induction." Let an "ultra-blog" be any blog with more than one reader. If my blog has more than one reader, then it is an ultra-blog. Of course, I chose a rather non-intuitive definition there, since you would think that "ultra-blog" would refer to something much more amazing than mine, but I'm completely within the rules here. Therefore, if I look into the world and find I have readers besides myself, I will have proven a posteriori (since it required looking into the world) that my blog is an ultra-blog. Math is made up of a priori truths. For example, "2+2=4" absolutely must be true, just by assuming the Peano axioms (explained so well by MarkCC), which basically define natural numbers and addition. Certain philosophers try to reject the idea that math absolutely must be true, claiming that it's only true by nature of our universe or something, but I think that's wrong. You might say that math requires certain axioms that we assume to be true, when they might not be. I might fix this problem by changing the statement to "If the Peano axioms are true, then 2+2=4." But I won't, since that's as silly as changing the bachelor statement to "If the definition of 'bachelor' is an unmarried man, then all bachelors are unmarried." Axioms are just like definitions, only they define mathematical systems (such as arithmetic) rather than specific words. Assuming that axioms are true is really no different than assuming that words mean what we define them to mean. Unless we're using unusual words or unusual mathematical systems, I think it's better to leave the definitions and axioms implicit. So in conclusion, I think there's one thing that we can be absolutely sure of: words mean what we define them to mean--by definition. There's a flash game online called Chat Noir that I just saw on JIG (the only worthwhile free-online-gaming site, if any at all). You're supposed to trap a cat by blacking out circles. This caught my eye, because I immediately realized it was a hexagonal variation on the Angels and Devils game. Don't ask me how I know about that! It took me a few tries to win. Deduction and induction are two kinds of reasoning. Sometimes, deduction is defined as reasoning that goes from a generality to a specific result, while induction is defined as reasoning that goes from a specific fact to a generality. Instead, I'm going to go with the definitions outlined by the Skeptic's Dictionary, which I feel are much more precise. Deduction is reasoning in which the premises necessarily imply the conclusions, and induction is reasoning in which the premises only indicate a higher probability of the conclusions being true. These definitions need some examples and explanation. Here's an example of a valid deductive argument, taken from the Skeptic's Dictionary. Note that the first two sentences are premises. However, there is actually no need for any premises. We can reduce it to a single tautology--something that cannot possibly be false. If all men are mortal and Socrates is a man, then Socrates is mortal. All valid deductive arguments can be reduced to tautologies. Of course, if the premise is false, the conclusion does not follow, but the tautologies remain true. If Newton's laws are true, I cannot levitate. I cannot levitate. Therefore, Newton's laws are true. Note that if the second premise was "I can levitate," then the conclusion, "Therefore, Newton's laws are false," would follow deductively. As is, it is an inductive argument. By itself, this inductive argument does not prove a whole lot, since we could use a similar argument to support any other number of scientific theories, as long as they all imply that I cannot levitate. However, if we added a large number of other inductive arguments (in particular, we would want inductive arguments that cannot also be used to support competing theories), we would have quite a persuasive argument. And yet we would still be wrong; Newton's laws have been contradicted by Special Relativity. On the face of it, induction is much weaker as compared to deduction. No matter how many inductive arguments you might accumulate, a single deductive argument can beat them all. But the problem is that without induction, we can argue hardly anything. We'd just be limited to math and logic. We rely on induction to argue many things: The universe is ordered, our observations are accurate, the sun will rise again tomorrow, etc. When I say science uses reason, I don't just mean deduction, I mean induction too. The whole scientific method isn't just some process someone randomly made up. First, induction is used to choose a hypothesis that successfully describes our observations. Then, we use deduction to predict further observations. Upon the confirmation of these predictions, we have acquired one more inductive argument supporting the hypothesis. Upon the failure of these predictions, we have, depending on the experiment, acquired an inductive or deductive argument against the hypothesis. It is often said that "nothing is certain." Well, ignoring deduction for a moment, this saying is true. But that's ok, because we don't need to be certain. It's not certain that the sun will rise tomorrow, but we can still say it's true. This puzzle wouldn't be called a "classic", but it is nonetheless a good demonstration of non-intuitive probability. Say I have a complete set of dominoes. Each domino has 0 to 6 dots on each side, and no two dominoes are the same. I take pick out a random domino with my eyes closed. While my eyes are still closed, I pick a random side of the domino and show it to you. You see six dots. What is the probability that the other side also has six dots? There are 7 possible dominoes that I could have picked out: 6-0, 6-1, 6-2, 6-3, 6-4, 6-5, and 6-6. Only one of those dominoes has six dots on the other side. The standard way of calculating probabilities is to divide the number of "hits" by the total number of possibilities. Therefore, the probability must be 1/7, right? Wrong. The standard way of calculating probabilities assumes that each possibility is equally likely. In this puzzle, that is not the case. In a complete set of dominoes, there are 28 dominoes, and each domino has two sides. Therefore, when I showed you a random side of a random domino, there were 56 equally likely possibilities. Not 7, but 8 of these possibilities had six dots. Those possibilities were the following: 6-0, 6-1, 6-2, 6-3, 6-4, 6-5, 6-6, and 6-6. That's right, I was twice as likely to have picked the 6-6 domino, because I could have picked either side of the domino and still gotten a six. Before I showed you the six dots, I was just as likely to pick 6-0 as 6-6, but with 6-0 there was a 1/2 probability of picking the zero instead of the six. Therefore, the probability of finding a six on the other side is not 1/7, but 2/8 = 1/4. If you don't believe me, consider this. There are 28 dominoes, and 7 of them have the same number of dots on either side. Therefore, whenever I pick out a random side of a random domino, the other side has a 7/28=1/4 probability of being the same as the side I showed you. Before I got into reading blogs, I used to be a puzzle enthusiast. By puzzles I specifically refer to free form word puzzles, much like the sort collected by Martin Gardner, or the ones written by Infophilia for the recent Skeptic's Circle. I got my puzzles from somewhere on the internet, and I even wrote many puzzles myself. I can't say I hold the same enthusiasm for puzzles that I once did, but I think it had a huge influence on me. For one thing, I was introduced to the internet. I became appreciative of writing, something that I don't think I really liked before. Writing a puzzle or solution can take a tremendous amount of precise communication. And of course, I learned a ton of random tidbits in logic, math, and problem solving. I think you could say that my interest in problem solving has manifested itself in other ways, now that I'm in college. You might also say that my approach to looking at issues has been shaped by my approach to solving puzzles. This is relevant to my blog, because there are lots of puzzle related things that I can talk about. I can explain lots of things I've learned in math and logic. I can analyze any of the classic puzzles (and I've seen them all). I can present some of my own puzzles or other puzzles that I've seen. Does that sound good? Right now, I have two distinct audience groups: people I know, and frequenters of the skeptical blogosphere. I intended it to be that way, but here's where I pay the price. I am introducing a new category: atheism. I'm aware that by off-line standards, it's a fair bit more provocative than my previous writings, but in the skeptical blogosphere, it's completely standard fare. So bear with me. I'm an atheist. I know, few were shocked. This post is accompanied by the adding of the 'A' on the sidebar, which is the logo for the Out Campaign. Richard Dawkins introduces it here. 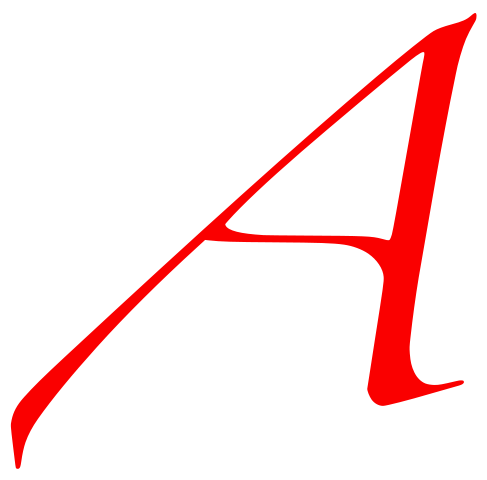 I'm told the logo is an allusion to the Scarlet Letter, but I didn't read that, so the reference is lost on me. I believe that joining the campaign is important because it helps break down stereotypes. Ok, well, I live in a part of the US where there is little stereotyping is going on. I think most of my friends already know I'm atheist, but I seriously can't tell because no one cares. Around here, the stereotype, if any, is that atheists care too much. For now, I'll only point out two things wrong with this. First, there are plenty of atheists that don't care too much, it's just that you can't tell them apart from anyone else (in science, we call this "selective bias"). Second, there's nothing wrong with caring. Just as I had said with skepticism, it would not be essential, if you knew me in person, to know I'm an atheist. But opinions blogging is conducive to this sort of expression. Expect it to be a regular (but not exclusive) topic. It's been only one week since I started, but there have already been several things that have surprised me. 1) How did I write so much? I just didn't expect to write something every day. I've always wondered how bloggers can update so often, but I think I understand now. 2) I don't want to scare anyone, but I was surprised how much info statcounter gives me. It doesn't tell me who is who, but it tells me the referring link, if any, and the length of the visit. It reminds me of all those times that I have left open tabs on various blogs for hours before actually looking at them. 3) So pretty much all the time I find myself saying the words "so" and "pretty." I guess that's the way I actually talk. I've been trying to delete instances of these words so I can add a bit of word variety. 4) I am a bit surprised to find I have a number of readers. But it seems no one will comment unless I specifically ask them to. People, I am not anti-social. Since some friends I know might comment anonymously, I'd actually be forced to be nice to you. Ok, I lurk all the time and understand the reasons for doing so, but I still stand by my hypocrisy. 5) Speaking of lurking, I find that the hits I get from commenting on other blogs gives me incentive to de-lurk more often. I guess that's one reason why the most prolific commenters are bloggers as well. If you didn't have time to watch that, the remote viewing demonstration consists of everyone drawing stuff randomly, while trying to visualize a picture inside a sealed envelope. In the mean time, the workshop leader (who knows what's inside the envelope) goes around the room making suggestive comments. After the session is over, the leader opens the envelope, reinterprets some of the drawings so that they seem to match the picture, and quietly discards all the misses. In summary, the demonstration consists of almost every mistake in the book. Michael Shermer got them to conduct an experiment in which the top-rated remote viewers would try to guess a picture of his choosing. The guesses are all over the place, but after the picture is revealed, the pictures are quickly reinterpreted as if they were completely right from the beginning. At this point, Shermer seems pretty exasperated. I was kind of disappointed at this experiment. I think I could improve upon it. First, it could use some double blinding, such as keeping Michael Shermer outside as they draw. I guess I can see why they might have wanted Shermer in the room for the video... But what this experiment desperately needs is some form of control. In the remote viewing experiment, how do we know whether that remote viewing does any better than chance? The remote viewers probably are indeed better than average at drawing things that resemble a randomly chosen picture, but how would we know whether some psychic phenomenon was going on? If I designed this experiment, I would have several separate people (we'll use non-skeptical volunteers, just to throw a bone) pick out several different pictures. A random picture would be put into the envelope. After the drawing session, the pictures are shuffled, and all given to the leader, who picks out the one picture he thinks was in the envelope. And of course, we repeat it several dozen times or until the error bars are sufficiently small enough. Compare to chance, leading to the conclusion: nothing of interest! But of course. Even without having actually done the experiment, I already know there's nothing of interest. Scientific theory strongly suggests remote viewing better than chance is impossible. Oh, sure, empirical evidence ultimately trumps theory, but empirical evidence can be mistaken, especially when your methodology is bad. And you have to remember that theory is so strong precisely because it is supported by lots of empirical evidence. As I demonstrated yesterday, I'm a big fan of Dinosaur Comics. It is what is known as "constrained comics", since it has the exact same pictures every day, only with different words. It is about dinosaurs who talk about philosophy and stomp on things. I occasionally search the archives when I need words of wisdom. Nearly every day, T-rex comes up with some crazy but fun idea, and his best friend Utahraptor critiques it. I like the implications that you can be critical and friendly at the same time. Utahraptor has got to be the best skeptical character in all of fiction (the burden of proof is on the reader to provide a counterexample). He also seems to be bicurious, an atheist, and a cephalopod sympathizer, so, uh, I think maybe some people here can relate to at least one of those. T-rex is also very lovable, and of course, he comes up with most of the ideas. Perhaps T-rex and Utahraptor can be symbolic of invention and skepticism? Logical fallacies are common mistakes in reasoning. Everyone should know about them. But I'm not just going to explain these fallacies. I also want to examine their underlying reasons, implications, and applications. So basically, any time anyone misrepresents his or her opponent, the misrepresentation is called a straw man. 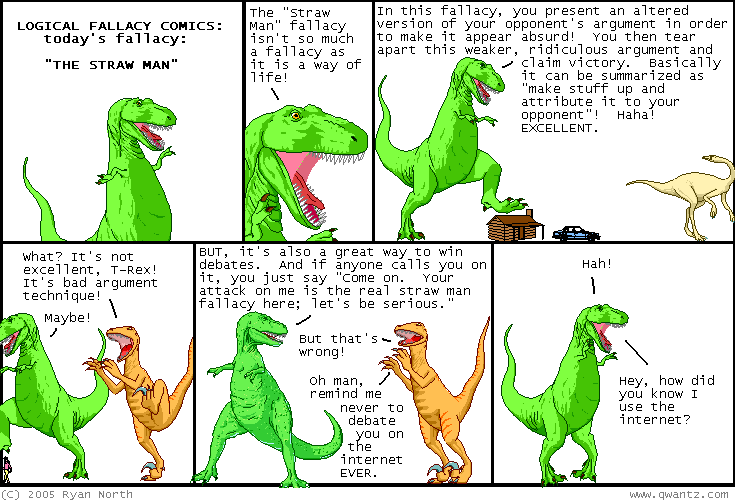 It is my opinion that the straw man is the most ubiquitous of all fallacies. It is actually very difficult not to use a straw man in any debate of moderate complexity. It’s just a simple matter of misinterpreting a few words or incorrectly guessing your opponent’s position. It can be intentional, unintentional, or somewhere in-between. Sometimes, people even give the misrepresentation a name. A good example is “Darwinism,” which is a label only really used by its opponents (though Sunclipse tells me academics outside the US use it too). I would have thought this was a poor strategy, since it’s relatively easy to point out that Darwinism is just the straw man version of Evolutionary Biology, but the strategy seems to work anyways. The straw man is the reason that it’s usually good to listen to both sides of a debate. It’s not because both sides are equally correct (God, no!). It’s because it’s very likely that both sides are, to varying degrees, attacking straw men. This is especially true when there is little contact between the two sides. In a debate involving a large number of people, straw men are inevitable. Usually, different people will hold a spectrum of views on a controversial topic. So if I, for example, argue that Creationism is silly because [insert glaring flaw here], some people can say, “You’re attacking a straw man, because I believe the creation stories are non-literal,” or “But I agree that YEC is ridiculous, no, I believe in OEC.” And they would be right. No matter what argument I use, no matter how valid, it is almost guaranteed to be a straw man with respect to someone in the debate. This raises the question: Is it really a straw man if it’s an accurate representation of someone out there? Some people get really indignant when they see straw men. In some sense, I think this is ironic, since straw men actually indicate a point where both sides agree—both sides agree that the straw man is wrong. You’d think that maybe occasionally, straw men would lead to two sides coming together in a common celebration of humanity or something, but it never works out that way. More common is the response T-rex gives us. Of course, the straw man fallacy should always be criticized, but since it’s such an easy mistake to make, I’m not sure that the people who use it should always be held morally culpable for it. I was debating with myself earlier whether I should try submitting a post to the Skeptic’s Circle. It’s probably too late right now to write something up, but there’s always the week after next. I’m sure it’s clear by now that my blog has a serious inferiority complex going on. I have a little trouble finding the motivation to do much self-promotion. Most of the topics in my mind are really abstract, with nothing so concrete as, say, debunking a specific claim. These are things anyone can think about; you don’t need me. I'm not sure who my audience is really. I've pointed this blog out to a few friends (making me only semi-anonymous), and I link to it every time I de-lurk, but I don't know if anyone has taken the bait. Anyway, sorry for this bit of cynicism. I’ve probably scared away what few lurkers I had, if indeed I had any. If you’re still here, drop a comment, or I’ll probably write increasingly angsty posts. Not really. In the mean time, I have to figure out how to get some sort of site statistics. In my previous post, I think I just kept on saying “science, science, science,” etc. etc. etc. I am perhaps a little self-conscious—I wonder if I look rather arrogant saying, “I know I’m right because SCIENCE is on my side.” “Aren’t there other ways of knowing?” my hypothetical second reader asks. For example, we can consider intuition a way of knowing (and I do) because we often find that our intuitions are later confirmed by observations. More generally, we can use observation and reason to determine how often and under what conditions intuition is correct, and, of course, it’s not correct all the time (while we’re at it, neither is science). For example, logical fallacies are usually a place where intuition can be mistaken. If we find a method that is reliable enough under certain conditions, we can use induction to argue that it is reliable even when science itself gives us no results. But first, the method must be tested by science. In conclusion, there can be other ways of knowing, but these other ways are really just indirect application of science, and even in some sense part of science. So I read a handful of blogs, all in the arena of science and skepticism. After mostly lurking for a year, I decided on a whim to create my own blog. At the moment, I am extremely humble about this. Most of the blogs I read are really major blogs that update frequently, and here, I'm writing a blog that I expect to accumulate no readers, and may go defunct mid-sentence. If I were not the author of this blog, I might never read it. I have low expectations, but we'll see how it works out. Assuming I ever write another post, I simply plan to talk about my opinions. As the title of my blog might indicate, my viewpoint is the skeptical viewpoint. If you, single reader, knew me in person, it would perhaps not be essential to know that I am of skeptical persuasion, but blogs are simply conducive to this sort of expression. I expect to mostly play around with abstract concepts, such as the arguments people use, and talk little about the things that pertain to real life. Thus "Skeptic's Play." I didn't think about the title too much.